A special exhibition offering paintings, jewellery and key chains made by students from the Emirates Autism Center (EAC) was held at Emirates Motor Company (EMC) showrooms to raise awareness about the center. 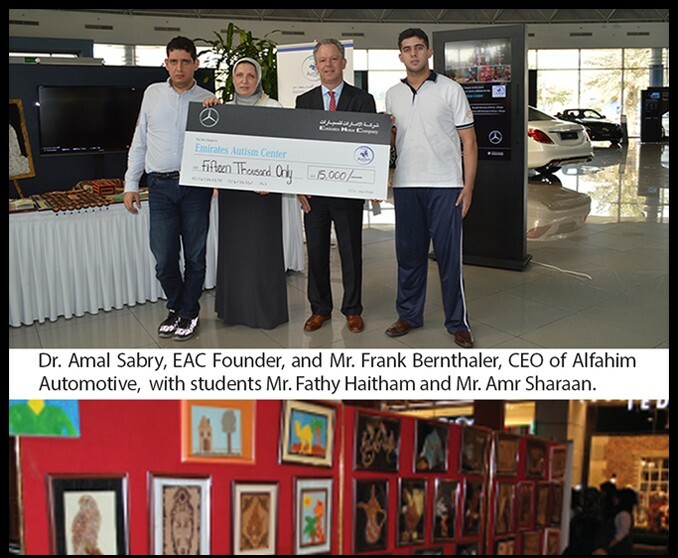 The two-day ‘Drive for Charity’ awareness exhibition saw students giving outtheir hand-made giftsina pop-up galleryat the EMC Mercedes-Benz showrooms in Mussafah and Marina Mall. The EACis a pioneer in the UAE for the inclusion of children with autism in schools, the workplace and society at large. The center was founded( in March 2007 and officially inaugurated on April 2008 under the patronage of HH Sheikh Nahyan Bin Mubarak Al Nahyan, Minister of Culture and Knowledge Development), by the efforts of parents of autistic children. Dr. Amal Sabry the founder of the center recently earned the Woman of the Year Awards 2016 by Emirates Woman for her humanitarian achievements in this field. AmalSabry, Founder and Managing Director of the EAC, said: “Events such as the ‘drive for charity’ are vital if we are to continue our work with individuals diagnosed with autism and their families. To show our appreciation for such humanitarian involvement by EMC, our students created special handmade gifts to raise awareness about the center and its vision. “It has been a huge success and we have seen lots of members of the community turning up to learn more about us and contribute to EMC’s generous initiative. All of the support from EMC, and the community as a whole, is greatly appreciated by us and our students and is a major help in improving their lives”. Mercedes-Benz authorized distributor in Abu Dhabi, EMC, which is the flagship company of the renowned Al Fahim Group family business, held the event as part of a “Drive for Charity” series of events.Earlier this year it partnered with the Abu Dhabi Sports Council and the Special Care Center in a charity campaign held at the HSBC Golf Championship. Frank Bernthaler, CEO of Al Fahim Automotive, presented the EAC with a cheque for 15,000 AED in EMC Mussafah Showroom. He said: ‘It is a privilege for us to support the fantastic work that the EAC has been doing and to help raise awareness for such an important and life changing cause. Autism affects 1 in every 68 children, which is more children than diabetes, AIDS, cancer, cerebral palsy, cystic fibrosis, muscular dystrophy or Down syndrome - combined. The EAC mission is to improve the quality of life for children with Autism and their families. It currently has50students, age 3 - 20 years, diagnosed with Autism Spectrum Disorder and over half of the center’s students are now successfully integrated in mainstream schools. This is one of, if notthe highest, inclusion rate in Abu Dhabi’.50 % of the students at the center are UAE nationals.